This is a project about web, realtime and visualisation. This project built a set of visualisations to show how many people were watching each BBC live IP stream. It showed the total numbers for all services but also showed a graph of the past hour split by platform. 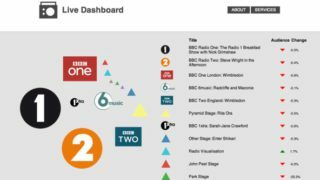 Although just a proof-of-concept, the dashboard was regularly used by production teams in the BBC for major events such as Glastonbury and Wimbledon but also for regular shows. Producers could see in almost-realtime what calls to action produced the most viewers. and, in a really exciting first time deployment, they were seeing real time page visit stats of all the BBC’s online coverage of the festival. No one has really done this in the BBC before - fed real time stats for access straight back into an element of the production team - and in a way it was like putting the production team right in the middle of the audience. Pretty appropriate for a festival really!